I HOPE IT PROVIDES THE INFORMATION AND RESOURCES YOU ARE SEEKING. DR. GEORGE J. DAVIES is an internationally known speaker who has presented hundreds of conferences throughout the world on sports physical therapy, athletic training, shoulder, knee, open and closed kinetic chain topics, orthopaedics, rehabilitation and Isokinetics. Davies is a clinician, educator, speaker, researcher, author, editor and consultant. He has been involved in the clinical practice of sports physical therapy/athletic training, since he was a student athletic trainer, for over 53 years. He has a passion for teaching and has been an educator for over 48 years in colleges and universities. 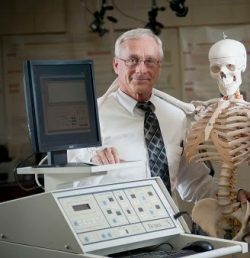 For the past 45 years, he has been involved in teaching undergraduate and graduate physical therapy courses including: cadaver anatomy, biomechanics, sports physical therapy, orthopaedics, and examination courses. Because Davies values education, after 30 years, he returned to school and completed his post-professional Doctor of Physical Therapy (DPT) at MGH Institute of Health Professions and graduated with highest honors. Dr. Davies has been involved in many research projects that have been presented at numerous national conferences and published in various journals. He has participated in hundreds of scientific conferences and workshops throughout the world in the last 45 years. He has published over 250 articles and research abstracts in various periodicals, has written several books and has contributed chapters to over 50 books. Davies was the original co-founder and co-editor of The Journal of Orthopaedic and Sports Physical Therapy for approximately 10 years. To honor Davies’s achievements, at the 25th anniversary year of JOSPT, the JOSPT, Sports Physical Therapy Section and Orthopaedic Section are honoring Davies by creating the George J. Davis-James A. Gould Excellence in Clinical Inquiry Award. This award will honor the best article published in JOSPT in the clinical area. He was also one of the original founders and co-editors of the international journal Isokinetics and Exercise Science for 5 years. Davies was selected as the associate editor for Sports Health: A Multidisciplinary Approach. This is an official publication of the AOSSM, AMSSM, SPTS-APTA and the NATA and made its debut in January, 2009 and was just accepted to MEDLINE, The National Library of Medicine’s premier bibliographic database. He served as the President of the Sports Physical Therapy Section-APTA from 1992-1998. He was the 1999 recipient of the Peyton Award to acknowledge and honor an outstanding member of the SPTS. It is the highest award offered by the Sports Physical Therapy Section for contributions to the sports physical therapy profession. Davies was the 1994 recipient of the American Physical Therapy Association’s prestigious Dorothy Baethke-Eleanor J. Carlin Award for Excellence in Academic Teaching. The purpose of this award is to acknowledge individuals who have made significant contributions to physical therapy education through their dedication and excellence in academic teaching. Only one faculty member per year earns the award. He was the 2000 recipient of the Coulee Region Officials Association Distinguished Service Award for 25 years of volunteer service to the LaCrosse community in the area of athletics and sports medicine. Davies also won the First Great Lakes Athletic Trainers Association Outstanding Educator Award in 2002. He was recognized for Excellence in Research and Scholarship, Armstrong: Winter, 2005 Publication. Davies was selected as a Fellow-American Physical Therapy Association (FAPTA), 2005. This award was created by the APTA “to recognize those persons whose work has resulted in lasting and significant advances in the science, education, and practice of the profession of physical therapy. In order to be nominated and receive this prestigious honor, each nominee must, according to APTA bylaws, be someone whose contributions to the profession through leadership, influence, and achievements demonstrate frequent and sustained efforts to advance the profession for a period of not less than 15 years preceding the nomination for election”. Davies recently received the Hall of Fame Award-Sports Physical Therapy Section-APTA, 2006. Davies won the NATA President’s Challenge Award for Outstanding Contributions to Sports Medicine, June, 2007. He was the Invited Keynote Lecturer: Mary E. Switzer Lecturer (Speaker is selected by who has contributed significantly to health care in this nation and in other parts of the world) Association of Schools of Allied Health Professions, Baltimore, MD.,October 31, 2008. He was also the recipient of the NATA Most Distinguished Athletic Trainer Award, San Antonio, TX, June, 2009. He was honored with The Alumni Award for Distinguished Faculty Service to the Academic Discipline at Georgia Southern University, formerly known as Armstrong State University, Savannah, GA., April, 2012 and the Distinguished Alumnus Award,Columbia University, Program in Physical Therapy, New York, May, 2012. He earned the Sports Physical Therapy Section’s award for Lifetime Excellence in Education Award, January, 2013, and was honored by inducted into the AOSSM Hall of Fame, July, 2013. The Orthopaedic Section-APTA and the Awards Committee selected Davies as the recipient of the James A. Gould Excellence in Teaching Orthopaedic Physical Therapy Award, APTA-SCM, February, 2016. One of the reasons Davies is involved in sports physical therapy is because the former U.S. Marine from 50 years ago also likes to think he is an occasional athlete by participating in: running (over 35 years), marathons (sub-3 hours), ultra- marathons, triathlons , iron-man triathlon, and weight training. Davies has also been involved in the martial arts for over 25 years. He holds a Black Belt in Karate and has been a Sensei (teacher) of Karate. He has also achieved the status as a certified Specialist in Martial Arts Conditioning (SMAC) of which there are very few in the United States. However, one of the accomplishments he is most proud of is that he is also a cancer survivor and continues to participate in some of the above activities.